The Beautiful Connie Which Still Flies Today 2012. The Lockheed L1049-F/C-121C Super Constellation Aircraft or the Connie as she is affectionately known is one of my favorite airplanes. She was originally built for the U.S. Air Force and was delivered to the 1608th Military Air Transport Wing, Charlestown, South Carolina October 6, 1955. She was finally relegated to storage at Davis Monthan Air Base at Tucson, Arizona in June 1977 where she became a home for the local pigeons. November 1991 saw H.A.R.S (Historical Aircraft Restoration Society) took responsibility for Connie to be restored and delivered to Australia. This work was completely undertaken by volunteers and took 5 years to complete as the team needed to fly to Tucson each time to continue work. On February 3, 1996 Connie arrived in Sydney after flying to Oakland, Honolulu, Pago Pago, Nadi then finally Sydney Australia. 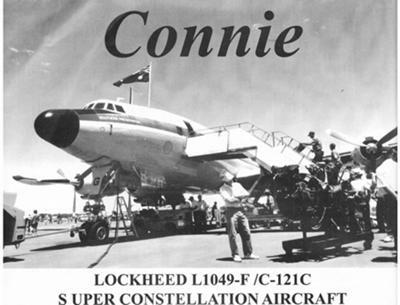 The last time I personally saw the Connie in flight was at the Avalon Air Show in Melbourne Victoria in 2009 if my memory serves me correctly. She really is a magnificent airplane with her tri-fin (three fins) tail. Join in and write your own page! It's easy to do. How? Simply click here to return to Airplane Pictures.